First, let me say that I first started reading Twilight about a year ago just to see what the big deal was. Stephenie Meyer has a way of sucking the reader in with an intriguing tale and interesting characters. I've heard all the complaints from people who don't like the series or can't see what the big deal is. I agree with some of it. Yes, Bella is immature and spoiled. Yes, Edward is controlling, and yes, Jacob is immature. Despite all their flaws, they still make for interesting characters and for fun reading. I'm not reading these books in search of morals or because I think the guys are dreamy. So, I've read each book one time and have borrowed them or checked them out of the library. I did buy Breaking Dawn because I wanted to read it right away and wouldn't be able to get it from the library soon. I don't think I'd ever reread any of them. One time is enough. 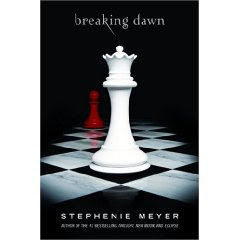 Bottom line, Stephenie Meyer is a great storyteller and has created intriguing characters. She's getting a lot of flack for the choices her character makes in the books and for how she depicts Bella. She's also getting a lot of negative reviews because it ends too happily and because Bella gets everything she wants. No negative consequences for her poor choices. I say, geez, it's just a book. So, here's my honest review. Breaking Dawn pulled me in right away. I read the first half quickly. I loved the part that was from Jacob's point of view. I thought the titles for each of his chapters were fun & creative. It was so refreshing to watch the story unfold from his point of view. That was my favorite part of the book. When it went back to Bella's point of view, I was disappointed, and those first two chapters after Jacob's part were very annoying and hard to get into. Bella was so annoying, and I stopped reading for two days. It really bothers me the book and all the secondary characters revolve around Bella. They would all give up everything for her and her baby, like their lives don't matter. After those 2 chapters, I got back into it again. Overall, I thought it was well-written and kept me wanting to read. (Once I got past those 2 chapters) Sure, some of the things that happened were a little strange, like Jacob imprinting on the baby. But, I'm not up-in-arms about it. The ending was fine and yeah, she lived happily ever after. Fine with me. So, I give Stephenie Meyer credit for an overall enjoyable series of books and congratulations to her for her success. Sure, I recommend the book if you can get past Bella being annoying. Faith- I think you're right. It wasn't anything different, but I think after being in Jacob's head for a large part of the book, it was just hard to get back into hers for me. Great review, Marcia. I'm just finishing up Twilight and I haven't decided if I'll read all four books yet. I also liked Jocelyn's insight in her review on this same book as well.